When it comes to music streaming services, Spotify is the biggest name on the market. They have access to over 20 million songs, and LG have today announced that the service will be available for the LG Smart TV in the UK. The app will enable premium users to discover and enjoy music. The premium service costs only £9.99 a month, but if you are already a subscriber, the TV app just is another added bonus, letting you use your television, and any added music system, to play your favourite music, tunes, playlists, all at your own leisure. You can also share them via Facebook and Twitter. There is a one month trial, completely free of charge, available for people signing up. The LG Smart TV range also boasts the likes of BBC iPlayer, Netflix, LoveFilm, BlinkBox, as well as YouTube, Twitter, and Facebook. Launch of Spotify indicates that LG are committed to the concept of Smart TVs, and we will only be seeing more apps appear on them. 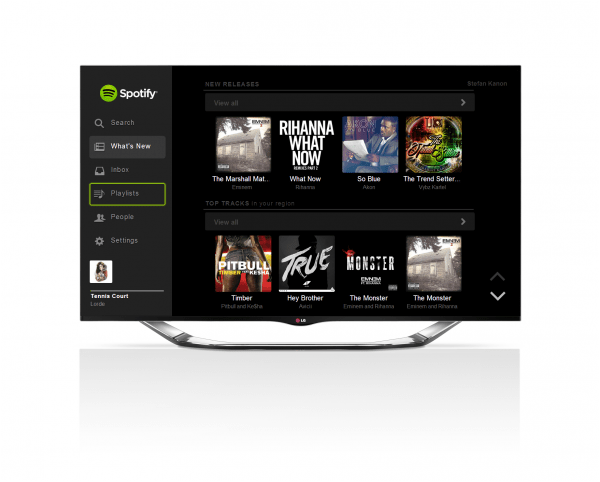 Spotify will be available on LG Smart TV from mid-December, launching in more than 30 markets including the U.S., UK, France, Germany, Spain, Italy, Nordics, Benelux, and Mexico.